Not enough of the right used cars for the market are keeping prices up. 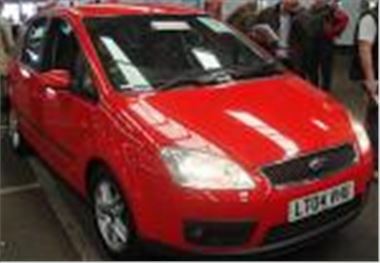 The closest to sensible money were a pair of 04 Ford C-Max, with 61k and 62k miles, which sold for £6,400 and £6,350. A section of VWs, BMWs and Renaults from Help Hire was subject to high reserves and very few were actually knocked down. The section, and presumably the cars, returns next Wednesday. Inchcape has a new sales programme, with both prestige and no reserve sections on Mondays, about 90 cars on Wednesdays and around 100 on Fridays. Times in the sales programme below. Here’s today’s list. ‘n/w’ means miles not warranted. ‘s’ means sold. ‘p’ means top provisional bid. Fleet & Finance, LTSB Autolease, Leasedrive Velo, Motability, Lex, Masterlease, Vauxhall Leasing, Hitachi Capital, General Section, Charters p/x, Private Sure Sell, Inchcape p/x. Fleet Direct, Lex, Lombard, Porsche p/x, Mercedes Benz p/x, Franchised Dealer p/x, Inchcape no reserve p/x, Evans Halshaw Group p/x, Hartwells p/x, Ridgeway VW p/x, Pendragon p/x. Fleet & Finance, Hitachi Finance, Renault Financial Services, Black Horse, Lex, General Section, Jardine p/x, Inchcape p/x, Leaseplan, Sytner p/x, Snows Group p/x, Trident Honda p/x, Hemmings Renault p/x, Help Hire ex-rental. Light Commercials from Leaseplan, Vauxhall leasing, Lex, Peugeot, Northgate, Fleet Direct, Non Runners (at 9.30). Fleet & Finance, LTSB Autolease, Leasedrive Velo, Motability, Lex, General Section, Citroen UK, Masterlease, Bank of Scotland, Hitachi Capital, Peugeot Motor Co, Charters p/x, Private Sure Sell, Inchcape p/x. TOP CAR, Bank of Scotland, Leaseplan, Porsche Retail p/x, Black Horse, Mercedes Benz p/x, Fleet & Finance, Franchised Dealer, Inchcape Prestige Section (12.00 noon), Inchcape no reserve p/x (10.00am), Evans Halshaw p/x, Hartwells p/x, Pendragon p/x. Volvo Car UK Ltd., Fleet & Finance, Leaseplan, Black Horse, Help Hire ex-rental, Lex, General Section, Jardine p/x, Sytner p/x, Inchcape p/x (90 + cars from 11.00am), Snows Group p/x, Trident Honda p/x. Light Commercials from Dagenham Motors, Royal Mail, Lloyds TSB, Northgate, Lex, Citroen, Fleet Direct. Fleet & Finance, LTSB Autolease, Masterlease, Leasedrive Velo, Motability, Hitachi Capital, Lex, General Section, Charters p/x, Private Sure Sell, Inchcape p/x (100+ cars from 10.15).